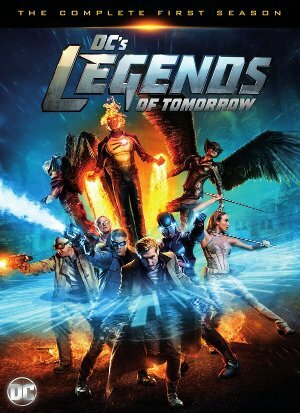 Building on the DC TV Universe created in Arrow and The Flash, DC's Legends of Tomorrow is a mixed bag. Cobbling together characters created for the show and others introduced on the on the other two shows as an unruly bunch of time travelers out to save the future, the show had more than few ups and downs during its First Season. Time Master Rip Hunter (Arthur Darvill) plucks a group of heroes and villains from modern day (rather than choose heroes from a wide swath of time which would have made more sense) to save his family and stop the villainous immortal Vandal Savage (Casper Crump) from conquering the world. Jumping through time, the First Season did have its moments such as a bleak future for Star City and Ray Palmer (Brandon Routh) and Kendra (Ciara Renée) getting stranded in 1958, but also some clunkers such as the team's stop in the Old West. Available on both Blu-ray and DVD, extras include the Comic-Con panel, deleted scenes, a gag reel, and featurettes on the timeship, western episode, and the show's jumps through history.